Rolling stones may not gather moss, but every 50 years or so they tend to return to their roots. 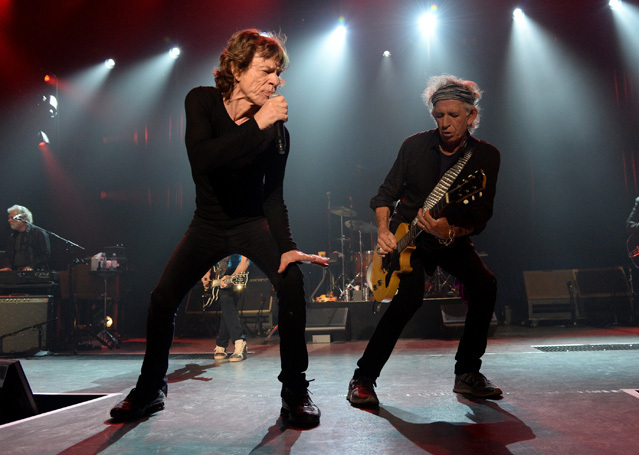 In the early 1960s, not long before they stormed the rock charts with classics like “(I Can’t Get No) Satisfaction” and “Paint It Black,” among many others, Mick Jagger, Keith Richards and the rest of The Rolling Stones—named after the Muddy Waters tune—lit up London clubs with the sound of Chicago Blues. Last October, back in London decades after those early club shows, the band turned recording sessions for a new album into impromptu jam sessions, belting out some of those early blues tunes for the first time in years. In an exclusive interview for Canada, only on EverythingZoomer.com, the band—Mick Jagger (73), Keith Richards (72), Ronnie Wood (69) and Charlie Watts (75)—discuss this return to their roots, how the new album came about and the appearance of fellow rock legend Eric Clapton on a few of the tracks. What does Blue & Lonesome convey about the Stones? MICK JAGGER: This album is a homage to our favorites, people that kicked us off in playing music. That was the reason we started a band. We were proselytizers of blues music. In the end, that’s what we’re still doing. RONNIE WOOD: I was talking to Jesse Dylan [son of Bob Dylan]. He was asking, are we a dying breed or is it going to live on, this kind of dedication and childhood enthusiasm we have to keep learning and keep touring and making music in a simple way? Hopefully, it’s not dying. Hopefully, we’re setting some standards for new generations to follow. KEITH RICHARDS: Blue & Lonesome encapsulated everything we wanted to do. And so finally, after 50-odd years, we’ve made a blues album … All I’ve ever wanted to be able to say is, ‘I passed it on.’ I think with Blue and Lonesome my wish has finally come true. How did you go about selecting songs? MJ: The first one was Blue and Lonesome, which is a very strange kind of direct emotive blues, heart-pulling thing. I like that one a lot. I had to go home and look at my collection. I tried to pick the ones that were not overly familiar to blues fans [and] make the song choices as varied as possible. KR: I just followed Mick’s enthusiasm. Once he got going, it was fascinating to watch. I’ve never seen Mick so intense on putting it down and getting it right and also making it much more part of the band than usually happens. Did you have to relearn these tunes or did muscle memory kick in? KR: Some of the stuff we hadn’t played since the club days. It was quite amazing. I don’t know if I can remember this. You don’t have to. Your fingers are remembering. It had that beautiful freedom about it. RW: Some of the titles were new to me like “Ride ‘Em On Down.” Others I knew by ear. Others, give me the key and the arrangement and I’m ready. A very unusual choice was “Little Rain.” I use it as a lullaby for my little twin girls. They love to go to sleep with that one. Four Little Walter songs demand a lot of harmonica. Mick, were you prepared for that? MJ: If I’d known I was going to do this, I would have been practicing for weeks. It’s not a very difficult instrument. The only thing about it, it’s not like a guitar or a keyboard where you can see what you’re doing. You can’t see the holes. You can only feel them with your tongue. The great thing about playing it in the studio, you can really hear. I’ve got the headphones on and I’ve got the vocal harmonica mic turned up really loud so I can hear every nuance. KR: Mick is really hitting his spots on this record; he’s the only one left who can play harmonica like this. A lot of people might forget what a serious musician he is. This album sets Mick up. His singing and his harp playing are beyond par. Eric Clapton plays on “I Can’t Quit You Baby” and “Everybody Knows About My Good Thing.” How did he come aboard? RW: That was another simple twist of fate. He was a wallflower [in the studio] while we were cutting one of the previous songs. (We asked him) would you like to play on this song and that song? His hands were hurting at the time. He did one song finger-style and one on slide. I think Eric excels when he plays with the Stones. Something magic happens. It’s the relief of not being the band leader and calling all the shots. He loves that. Once you’d finished 12 tracks and started considering the next step, did everyone like the idea of funneling these covers into a distinct album? CHARLIE WATTS: I did, but then I’ve always thought we should do an instrumental album. The Rolling Stones are a very good blues band. This is an example. When we let go, that’s what we sound like. I personally am very pleased with it. I know Keith particularly, but me as well, always wanted to do an album like this. I think it’s a very good thing to do even if it’s not a big thing. (The songs) sound pretty authentic, actually. RW: I feel really good about a blues album. It’s a natural thing. I’ve come full circle from being the (Stones) fan in the early days to cutting the blues with them now. Did these sessions transport you back to your earliest days of hearing and playing the blues? KR: This is taking us back to the beginning and there’s a real sense of déjà vu. We’re playing songs, some of them we haven’t played since 1962 or ’63. It’s Southside Chicago blues from the late ’50s era, perhaps the epitome in sound, singing, and songwriting. MJ: It was a completely different style of music to the kind of saccharine pop that was available. It was very raunchy compared to most pop music. It spoke to direct experience, and the sounds were more vibrant, the rhythms more interesting and more danceable. It had an instant appeal. For my generation, it’s the equivalent of suburban white kids doing rap. It’s so culturally far away from your own experience. I’ve been doing it for so long, I’m probably more connected to it than when I was 19. I love doing it. CW: I played jazz. I actually had never played blues until I joined Alexis Korner’s band (Blues Incorporated). When I got with the Stones, it was Muddy Waters and Jimmy Reed. Rock ‘n’ roll and jazz are sort of a fringe thing of the blues. Huge similarity. The blues are what they borrowed from. Chuck Berry is a great blues artist. Likewise Louis Armstrong. If you play jazz, you play the blues. RW: I was on the happy receiving end of imports coming in. The ones we did get our hands on came in the form of collections. It became our bread and butter. I had a little record player in my bedroom, and I used to copy the licks and do my impersonation of Chuck Berry or Big Moose and some of the guitar players – Elmore James, Hubert Sumlin. You dipped into Blue & Lonesome at your Desert Trip Festival appearances. Do you foresee playing more of these songs on stage? MJ: To do one song and then go back to playing Brown Sugar is kind of difficult. It’s a different kind of music and it requires a different discipline and sound mixing. You can do it but it’s easier if you did them all together. If you were in a small club, if you could ask the Stones to play quietly, if that was possible, then you could probably do it. CW: For me, they need a room, a club. I’ve never been to a football stadium to see anyone. I think it’s the daftest place to see music. And I make my living doing it. Would you consider digging out more vintage blues for a sequel? KR: I would do anything again as long as the impulse came from within the band. The stones never plan anything; Blue and Lonesome just came together. Never say we should do volume two or we should do a country album. With the Stones, things just happen. If you’re lucky and the mikes are hot and everybody’s on, then catch it while you can. Blue & Lonesome is available in stores and online today.